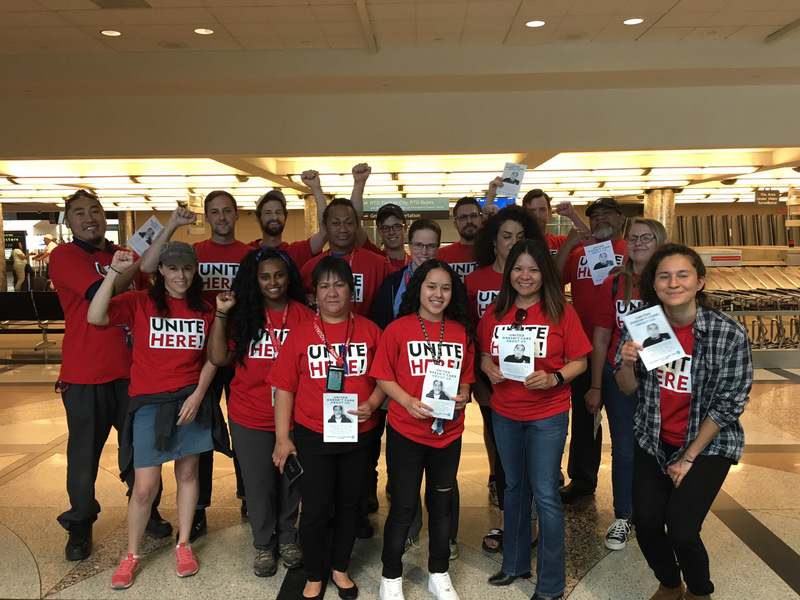 It has been a busy summer for Denver’s friendliest socialist organization. Alexandria Ocasio-Cortez’s congressional primary victory in New York is giving DSA a major boost in national attention. We are feeling a surge locally as more and more Coloradans see the promise of a radical political alternative. Read on for highlights from the past month and alerts about upcoming events in July! Denver DSA elected a new, eleven-member Steering Committee at the June 9 Business Meeting. Our formal leadership for the next year now includes the chairs of the nine permanent committees as well as a secretary and treasurer. This widening of responsibility within the chapter will better distribute day-to-day workload, improve internal communication, and develop new layers of member participation. Congratulations to our first state senator in Colorado! On June 26, Julie Gonzales and her team had a big win in the Democratic state primary for Senate District 34. Denver DSA is honored to have worked alongside Julie since endorsing her last year. 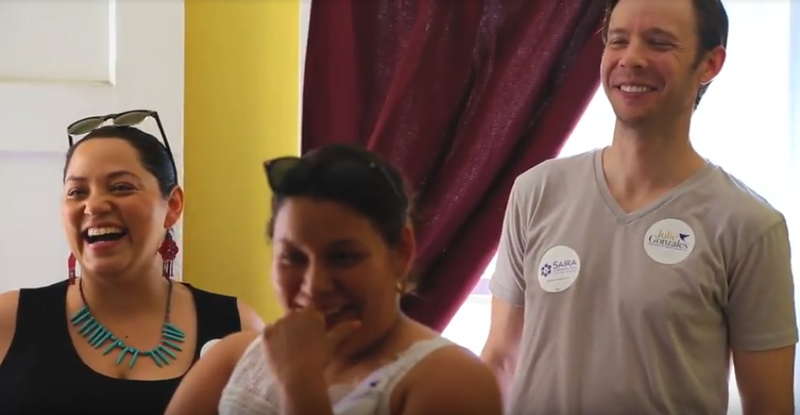 Dozens of our members contributed by knocking doors, phone banking, creating a campaign ad, and more. Julie joined DSA shortly after her victory. Click the image below to watch our campaign video! Denver DSA co-sponsored the Families Belong Together Rally on June 30 with a coalition of local progressives including CIRC and AFSC. The gathering was a huge success. Thousands turned out to demand justice for immigrant families, and hundreds stopped by DSA’s tables to get free water and learn about democratic socialism. We also distributed 1,000 “Abolish ICE” signs to the crowd, which noticeably pushed the tone of the rally to the left. Comradely Greetings! 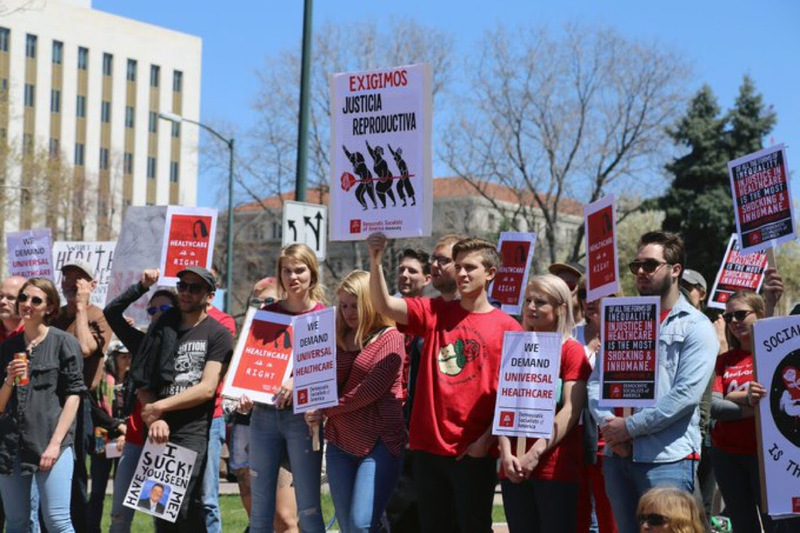 It was a very busy March for the largest and friendliest socialist organization in Denver. Read on for big news from the last month, and find upcoming events at the bottom of this email. See you soon! order to serve the needs of the many, not to make profits for the few. This pro-socialist statement is based on Clause IV, and was circulated by more than a dozen Denver DSA delegates as a petition to the Platform Committee the morning of the assembly. The DSA organizers easily collected enough signatures to bring the amendment to the floor, where it passed with overwhelming support from the assembled delegates, representing every part of Denver County. Read Denver DSA’s press release and watch a video of the amendment passing at https://www.denverdsa.org/caucus2018/. We’ll be hosting a rally at the State Capitol on April 22nd to invite Coloradans to join us in the demand for a healthcare system built around people, not profits. For more information and to RSVP or volunteer for the Medicare for All campaign, visit https://www.denverdsa.org/m4a-rally/. 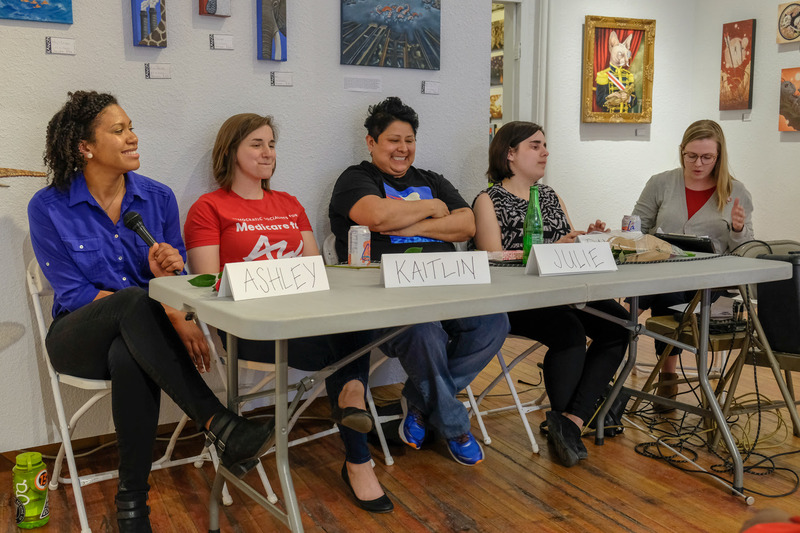 On March 11th, the Feminist Socialist Committee held a panel for International Women’s Day to hear and better understand the diverse experiences of women in their workplaces. Moderated by our very own comrade, Ashlyn Velasquez, we heard from four amazing speakers Julie Bañuelos, Danielle Montour, Kaitlin Peterson, and Ashley Panelli. We challenged ideas about feminism and capitalism, and explored how we can improve working conditions for women. Thank you to all of our comrades who volunteered equipment and people-power for a very successful event in a beautiful art gallery. The FemmeSoc Committee is excited to plan future events! At the Denver County Democratic Assembly on March 24, Denver DSA-endorsed candidate Julie Gonzales vied for the support of nearly 500 delegates in Senate District 34. After being nominated by Noelie Quintero and Denver DSA’s very own Drew Layton, Julie delivered a rousing speech calling for affordable housing, increased funding for public education, and healthcare for all. Once the votes were tallied, Julie came out on top with a staggering 89% of the vote. However, she still has a long fight ahead of her. Three other candidates gathered enough signatures to appear on the primary ballot in June, ensuring the next 3 months will be the most critical for her campaign. To donate and volunteer for Julie, please visit her website at https://julieforcolorado.com.